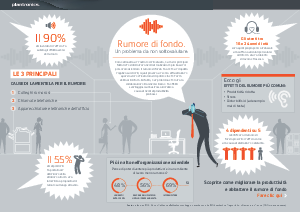 > Plantronics > Rumore di fondo. Un problema da non sottovalutare. Rumore di fondo. Un problema da non sottovalutare. Noise is a key factor in lower levels of staff motivation. It negatively impacts customers who are frustrated when they are asked to repeat themselves. This white paper helps you understand how noise undermines collaboration between teams and it even disadvantages the business through lower levels of productivity.